BLOODY SPOILERS AHEAD: Tonight’s episode is a direct continuation from last week, literally picking up seconds after we left off. The music, similarly, is a close cousin to last week’s score. However, that score emphasized the hushed, conspiratorial actions of the mutineers setting up their plan, and Blood on the Scales is more consistently bombastic and aggressive: a full-out war in music. 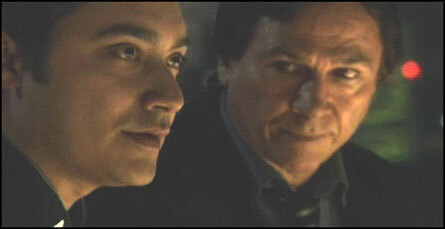 The score of Battlestar Galactica has always been a mixture of musical cultures from around the world. 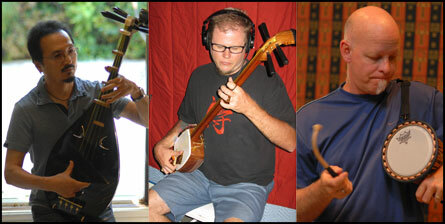 However, my music for The Oath featured distinct Japanese influences by incorporating the biwa, shamisen and tsuzumi. These Japanese instrumental colors were so effective last week, I featured them even more prominently in Blood on the Scales. They are woven throughout the entire episode, adding energy, forward momentum and a distinctly unique Kabuki theater / Chinese opera feel. 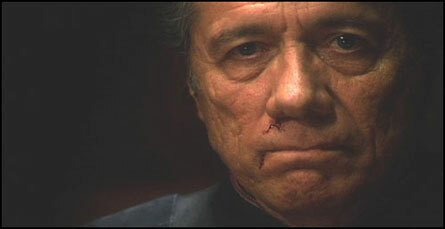 I learned valuable lessons during The Oath, and applied them to my work on Blood on the Scales. As a result, the score to Blood is more refined, polished and ultimately even more effective. The first lesson was that, while the shamisen and biwa blend together beautifully, the shamisen is much louder and tonally clearer than the biwa. The biwa was getting a little lost in the mixes. For this week’s show, I altered my approach and wrote in such a way as to allow more room for Doctor Osamu Kitajima’s haunting biwa performances. While the instrument is threaded throughout the entire score, the most prominent biwa solo can be heard as Kelly marches down the hallway. He sneaks away from the pack, breaking down beneath the weight of his guilt and confusion, and the solitary biwa speaks to his isolation and desperation. 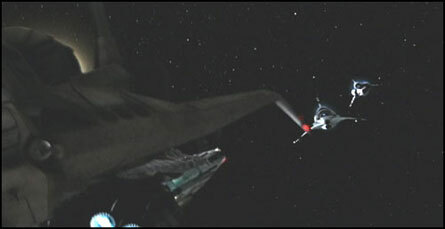 For most cues, the Kabuki theater / Chinese opera inspired instrumentation was added to the typical Galactica ensemble. But, I had so much fun with these sounds, I decided to write a cue using only these and similar instruments, to give the score a more genuine, authentic Asian feel. The scene I picked for this experiment was the beginning of the episode, as Roslin’s raptor escapes to the baseship. I wrote an extremely energetic action cue, but I stripped away all Middle-Eastern percussion, woodwinds and European harmonies. I removed all trippy synths and electronic effects. The only instruments I allowed in this cue were ones that would realistically appear in traditional Japanese music: taikos, small hand percussion, chang changs, tsuzumi, bansuri, shamisen and biwa. The only other time I’ve ever experimented with this idea was during “Fight Night” from Season 3, which was scored for taiko ensemble and Chinese membrane flutes. However, at the end of the cue, I broke down and threw in a huge wall of wailing synthesizer textures. This time, I wanted to see if I could resist that temptation to fill out the arrangement with non-Eastern sounds. For Roslin’s escape, I basically succeeded. The cue weaves and ducks through all the necessary emotional beats without the help of strings, synths or Middle Eastern soloists. However, the resultant ensemble is still an unusual combination of instruments (biwa and shamisen are never found in one group, for example). But, it still sounds distinctly Japanese and was immensely fun to write. To further enhance the Japanese musical character of this first cue, I lifted my long-standing ban on the use of shakuhachi in the score to Battlestar Galactica. 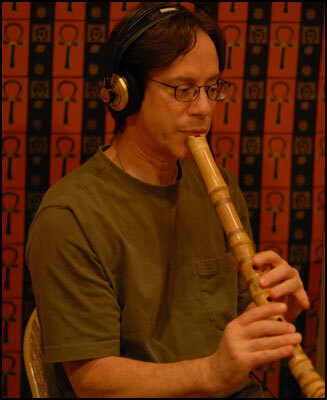 I’ve generally avoided using this instrument simply because there was a period in the late 90’s when every film and tv show seemed to have a shakuhachi in the score and I frankly grew weary of the sound. However, the timbre is relatively unique, so I made an exception for this cue and asked Chris Bleth to bring it along with his other woodwinds. 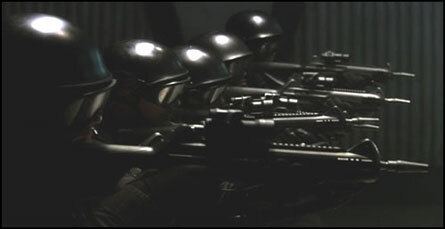 A shakuhachi on Battlestar was bound to happen one of these days. Chris Bleth is our woodwind virtuoso on Galactica. I’m always impressed with his work ethic and incredible talent, but was particularly amazed by him during sessions for Blood on the Scales. Chris was unable to record for The Oath because he was a little busy that week… getting a new frakkin’ kidney! This was a surgery that we all knew was coming for some time, and we’d always hoped that it wouldn’t occur when we were in the middle of scoring a season of Galactica. No such luck. The woodwinds for last week’s The Oath were actually performed by a sub, Pedro Eustache. I didn’t point it out last week, but you can actually hear the stylistic difference in the performance of the duduk and bansuris in that score. Pedro did an outstanding job, and I’m grateful to him for coming in and playing these rare and exotic instruments. But, I was eager for Chris to return. His musical voice and personality are connected directly to the soul of this series and it felt wrong to do even a single episode without him. I asked Chris about the experience and he said “I was in recovery for maybe 5 or 6 hours. I don’t really know because I was so doped up and had a morphine drip that they told me to use. I remember talking to the nurse a couple of times and then being wheeled into my room and having to ‘help’ them slide me over to the bed. That hurt like hell because the abdominals came into play and they were cut up pretty well. A preview of the next few weeks at that moment. They kept me in the hospital for 4 nights. Shortly before we began sessions for Blood on the Scales, Chris called me up and let me know he was ready to come back into the studio. I was thrilled, but also nervous that he was pushing himself too hard. However, a few short weeks after he had a major surgery, Chris was back playing duduk, bansuri, membrane flutes (and shakuhachi) and sounding incredible as ever. This is a guy who had an organ replaced during production of Season 4 and only missed one episode. That’s the kind of dedication our musicians have to Battlestar Galactica! For Blood on the Scales, I didn’t compose any new melodies at all, but allowed myself to dive into the toy-box of themes I’ve already created and weave them in and out of the musical texture. I took the Kabuki theater / Chinese opera concept introduced last week and expanded it into the most theme-driven, operatic, dramatic and narrative score I’ve ever composed for Battlestar Galactica. 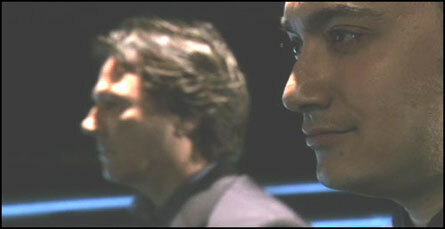 Zarek makes his case, assuring him it’s not murder, but a coup. Here, Paul Cartwright’s electric violin takes over and whispers a statement of Zarek’s theme, both sad and deathly ominous. This literal character-theme-based scoring can become oppressive if not handled delicately. And, though the duduk and electric violin are literally conversing back and forth exactly as Gaeta and Zarek exchange lines, the musical presence is understated enough that it doesn’t stand out or feel overtly manipulative. 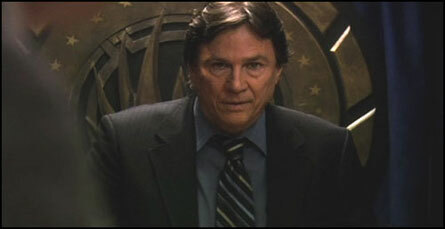 Richard Hatch, who plays Tom Zarek, told me that the scene in Colonial One after all the council members had been slaughtered was “the most painful and challenging scene I’ve ever played in my life. Amazing how we actors can get so emotionally involved in our characters and the situations the writers put us in really push our morality buttons. This situation reminded me of the scenes on the Pegasus where Cain has to kill civilians to protect the greater interest of the fleet. Don’t know many people who could make such a call and live with themselves. Tom had to become more or less than human to make that call depending on how you look at it, but for me and I believe Tom Zarek, this had to be the most challenging and painful decision of his life. He had actually grown to care about many of these council members and they had come to believe in him and support his agenda, and now he had to commit fully to the mutiny and the adage that you’re either with us or against us and there is no in-between. This theme has been around since season one, but has actually never made it on to a soundtrack album yet. 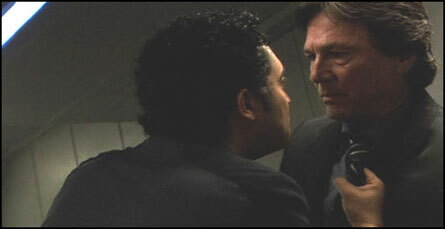 It underscores almost every scene that Tigh and Adama have ever shared. 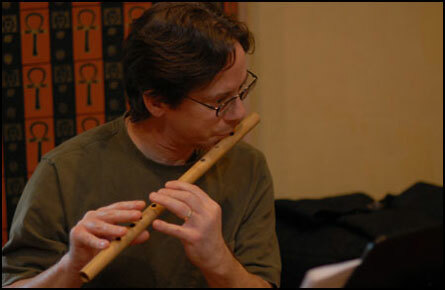 It’s first heard in Blood in minor mode, played in a melancholy statement on the bansuri, when Zarek lies to Adama and tells him that his friend, Saul Tigh, has been killed. 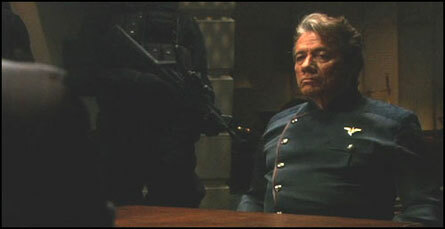 The theme recalls every close moment they have ever shared, and underscores the crushing heartbreak Adama tries to hide from his captors. The second time the bansuri plays this theme is in a very different character. At the moment we reveal that Tigh and his gang have saved Adama from execution, an intense percussion arsenal blasts in, featuring the shamisen, biwa and tsuzumi stronger than ever before. As Adama steps forward and addresses the captured mutineers, the military theme returns, but this time played with energy and inspiration, back in its original major mode. 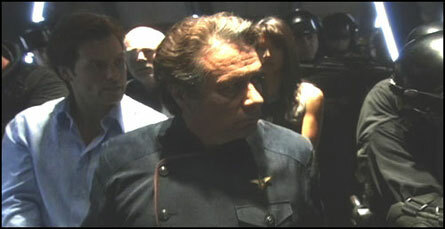 The theme functions as a call to arms, as Adama announces he’s going to take his ship back. We hear the military theme a third time as he marches through the halls with his growing army of supporters. Here the arrangement is huge, an uplifting march set against a blazingly fast taiko groove. Finally, the distinct bansuri / membrane flute duet sneaks in, completing the theme. While Lampkin’s tune is only heard briefly throughout Season 4, I was glad that I wrote it for Sine Qua Non so I could bring it back for this brilliantly tense scene. The Lampkin theme returns during Romo’s most exciting scene in the entire series, in my modest opinion. After he stabs a guard to death with a ballpoint pen (mightier than the sword, indeed! 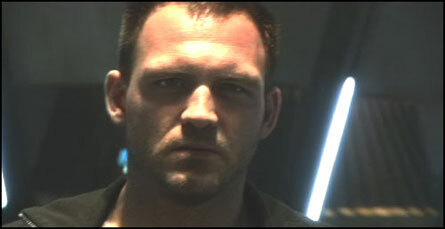 ), his theme is whispered gently by Chris Bleth on the bansuri while he collects his belongings from the marine’s dead body. As I’ve said before, Kara’s character has multiple thematic ideas associated with her. The erhu is strongly connected to the Kara Destiny Theme, so in using it to state the Starbuck Theme, I hoped to make a subtle, subconscious connection between the two. After her discovery of her own body on Earth, her dual identities as a headstrong solider and as a leader with a mystical “destiny” are becoming intertwined, and so must the two different themes. We hear it first as she broadcasts her renegade signal. 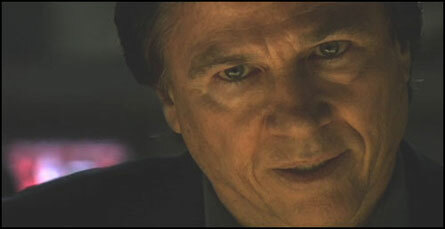 Despite the fact that Adama believes Saul has been killed, hearing Laura’s voice instills him with hope and strength. Her theme here helps underline this idea. And of course, her theme underscores her shockingly energetic and aggressive “I’m coming for you!” speech. It starts simply, sneaking in as she first refuses to surrender, played on a membrane flute and erhu. Then, as her momentum picks up, a heavy percussion groove gathers steam and the shamisen and biwa build a steady groove underneath. Musically, they are well-represented in Blood on the Scales. I incorporated their themes to underscore their nearly every action. 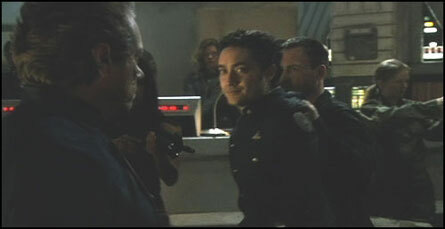 Prominent statements of Gaeta’s Lament can be heard as Adama is brought before him in the CIC at the beginning of the episode. 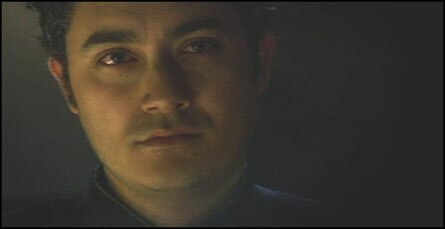 A solo erhu states another melancholy verse as Gaeta stands in Adama’s quarters at the end, making the decision to execute the Admiral. 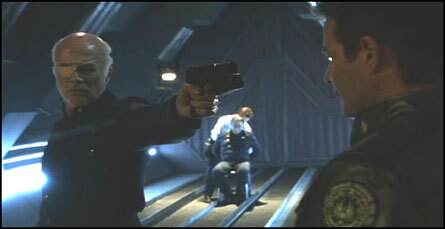 The darkest version plays when Adama takes back the CIC, as he stares down Gaeta with an icy glare. Zarek’s theme can be heard as he decides to execute the quorum and throughout the scenes in the CIC where he is calling out orders. The most powerful statement comes towards the end, immediately after Gaeta yells “Weapons hold!” This is the moment where Zarek realizes that Gaeta has found the line he won’t cross and that their cause is lost. Even though we know this is, in fact, a victory for Adama, I played this brief moment with a tragic statement of Zarek’s theme, because he knows, as does the audience, that there’s no way he’s going to survive this turn of events. However, for me personally, this episode is all about Gaeta. 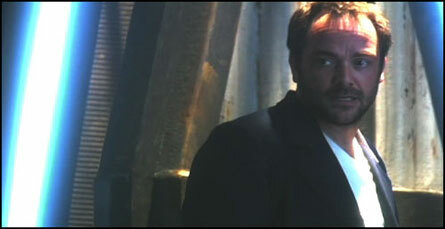 I’ve always felt a great deal of sympathy for him, and enjoyed his character. Then, when I was able to write a song for him in Guess What’s Coming to Dinner, I felt like I had a personal investment in making his character even more sympathetic. That made it all the more painful (and rewarding) for me to work on this episode, to witness him take this destructive path. The Gaeta and Zarek themes are predominant also because I knew I would have no further opportunities to bring them back in later episodes. We must say goodbye to them both before the end of Blood. 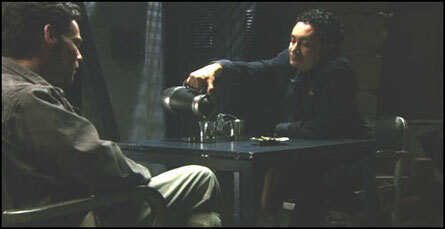 The scene leading up to the execution features Baltar and Gaeta speaking over coffee and cigarettes. Their conversation is heart-breakingly intimate and honest. Here, we learn more about Gaeta’s past, when he had a promising future before him. The score exudes a calmness, a sincerity and pathos that is meant to be simultaneously lyrical, warm and un-nerving. The strings ebb and flow like a tide beneath the accompanimental figure, infusing it with a gentle warmth missing from the Guess What’s Coming to Dinner score for which it was composed. I was careful to tread lightly, so as not to overload this scene with sentimentality. Gaeta speaks of his life as a young man, finally leading to his discovery of science. At this point, a lyrical, solo erhu plays the Verse of Gaeta’s Lament. I wanted to underline this shift in the conversation, because he’s now speaking of the stage in his life when we, as the audience, first met him. 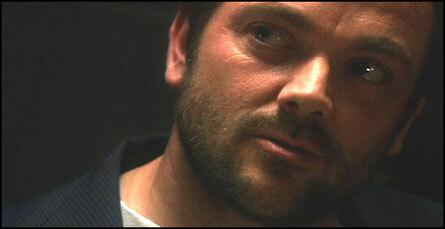 He was an energetic, young science officer who looked up to Baltar as his hero. How pitiful that he should end up here, confessing to him under these circumstances. 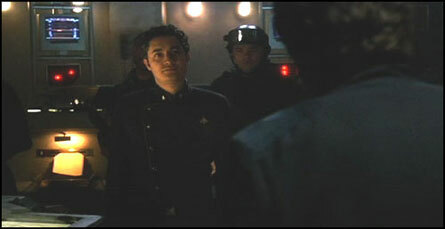 Baltar assures him, “I know who you are.” The score holds a single long note that sustains as we reveal that Gaeta is now beside Zarek, before the firing squad. As the firing squad is revealed, the lingering tone in the score begins to fade away, leaving only the high strings on a gentle fifth harmonic. The music is completely stripped of emotion now, neither sad nor celebratory. It’s simply an open fifth that feels unresolved, as if the score is about to go somewhere else. But instead, it disappears into complete silence, just a beat before Gaeta looks at his amputated leg and realizes the itching had subsided. “It stopped.” And with that, the music stops as well. We cut to black on the reverberant echo of gunfire that provides an appropriately musical punctuation to this tragic story.